I recently sold my ukulele to my friend Danielle. I needed another one for this month’s gigs so I got right to it. I was inspired by the simple sap wood streak in the back and sides to keep everything else simple too. 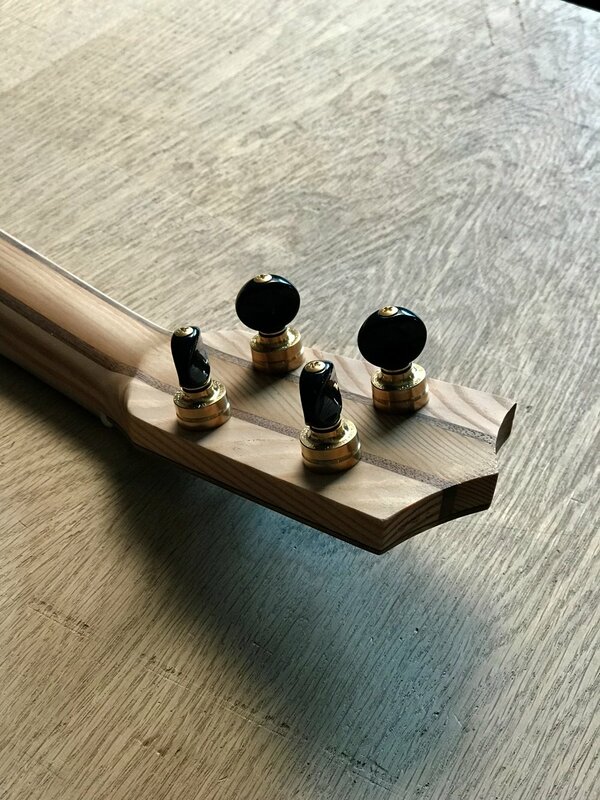 Tight grain spruce top, no front dots on the two tone pistachio fretboard, no rosette or sound hole binding. I used multi colored pistachio binding to mimic the streak on the back. The neck is a fir floor joist from the Level beer property in Portland. The walnut is from Goby and the Port Orford Cedar and pistachio are from woodfromthewest.com. Oregon walnut with a subtle curl, multi colored pistachio, raw brass and textured natural goat skin. It seems that these aren’t just musical instruments, they are also mixed media works of folk art. Yes, I am always trying to perfect each step and raise the quality level, but the hand made touches, natural flaws and contrasting textures keep it humble. What was once a pile of raw materials is now ready to sing. Walnut from Goby and pistachio from California orchards. Sometimes when you select a rough board, you can imagine exactly how it is going to look under finish. Sometimes, it’s a surprise! In this case, the walnut back and sides were much fancier looking than I anticipated. Bonus! 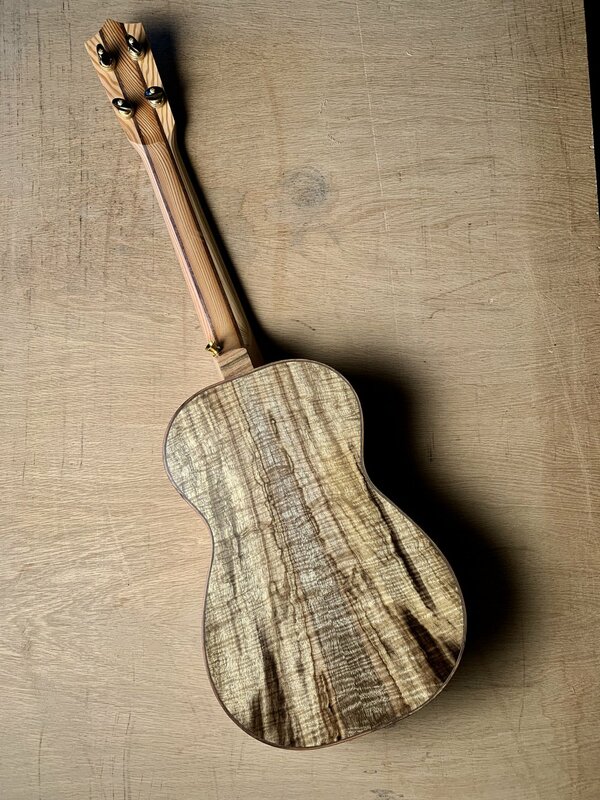 The Curly Port Orford Cedar top looks amazing and gives a balanced voice to this Baritone. 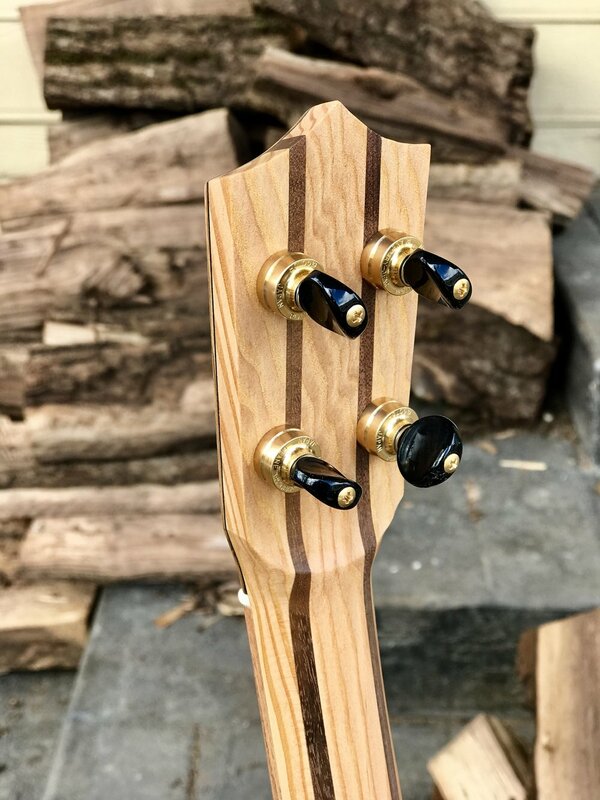 The Oregon walnut is urban salvage from Goby, the pistachio and POC come from woodfromthewest.com, the neck is salvaged old growth hemlock. 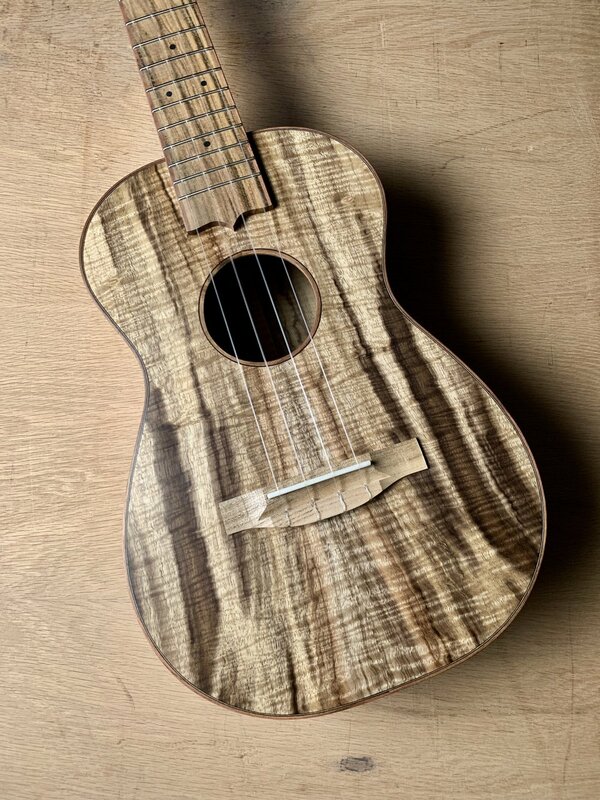 The baritone Ukulele is a bit of a strange sibling to the Tenor. 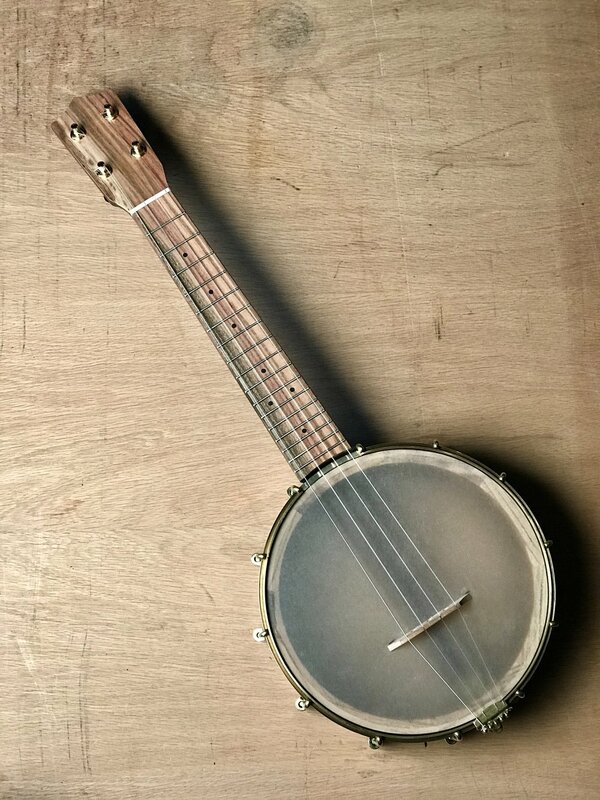 It is tuned to a lower pitch and often seems the odd one out at the Ukulele club. 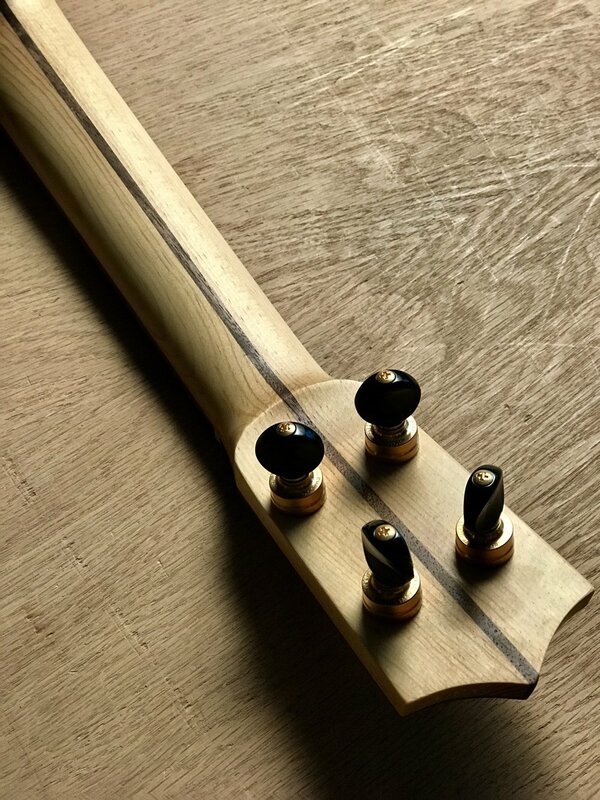 But, over the past four years, many pros have taken to them for their main performance uke because of the wide range and rich sound. 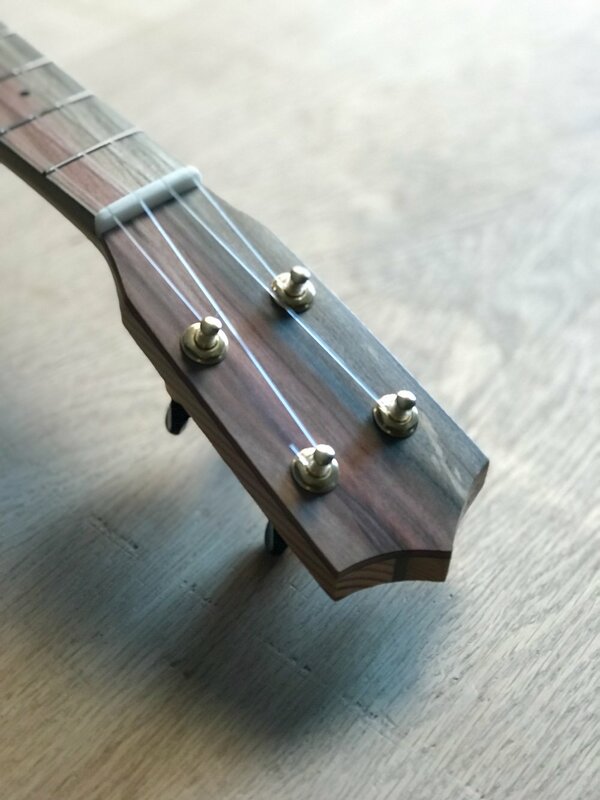 You can always put a capo on it and strum it like a regular uke too. The cheaper 1960’s all mahogany baritone is usually dark and quiet, the challenge is to make a baritone that projects it’s sound and has a rich deep voice. 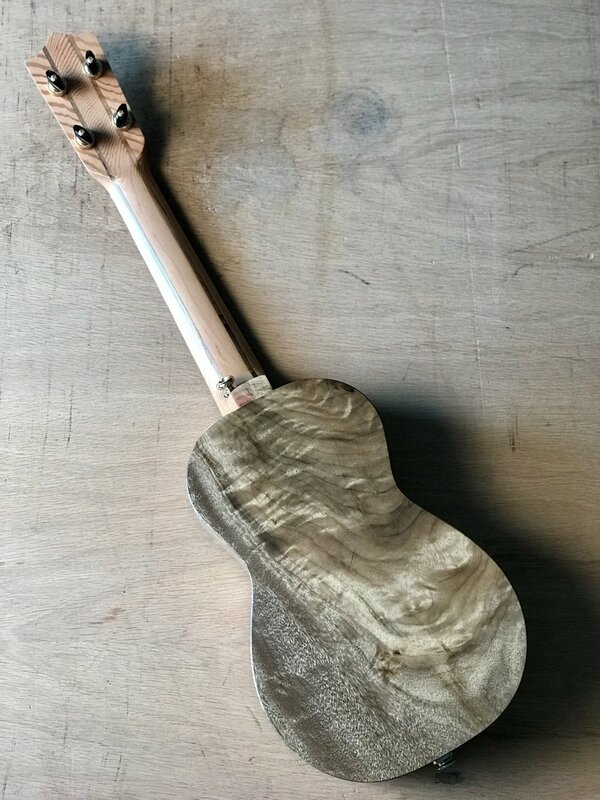 This one uses Port Orford Cedar, grafted walnut and grafted pistachio from woodfeomthewest.com. 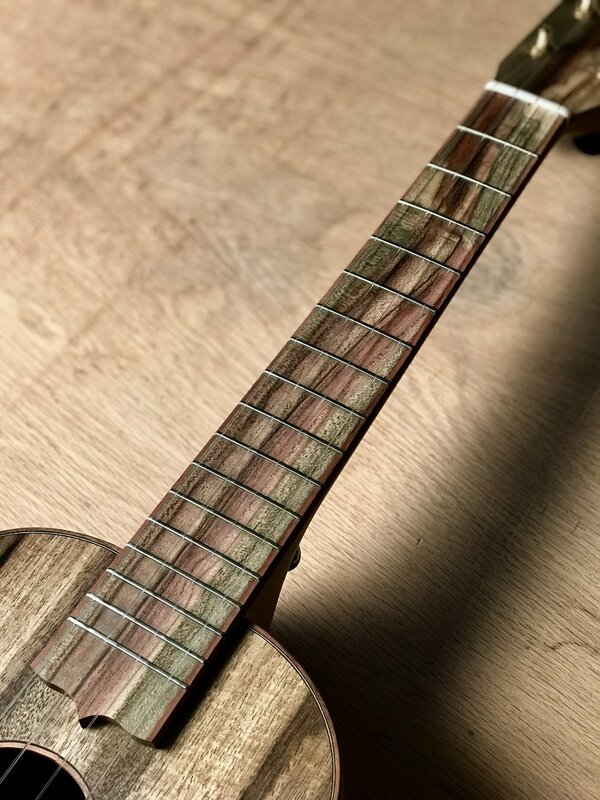 The fir neck is made from salvaged floor boards. This is another breathtaking example of how lucky I am to work with Oregon Myrtle. This mastergrade set looks spectacular, is easy to work and has a lovey balanced tone and volume. The Myrtle tenor has long been a flagship instrument for me and I don’t see that changing anytime soon. The Myrtle and pistachio come from woodfromthewest.com and the fir floorboards for the neck come from a barn in The Dalles, provided by Portland Salvage Works. I have a special stash of wood that I got from Char at Mya-Moe when she retired. She went around the shop and selected a few of her favorite sets for me to use in the future. 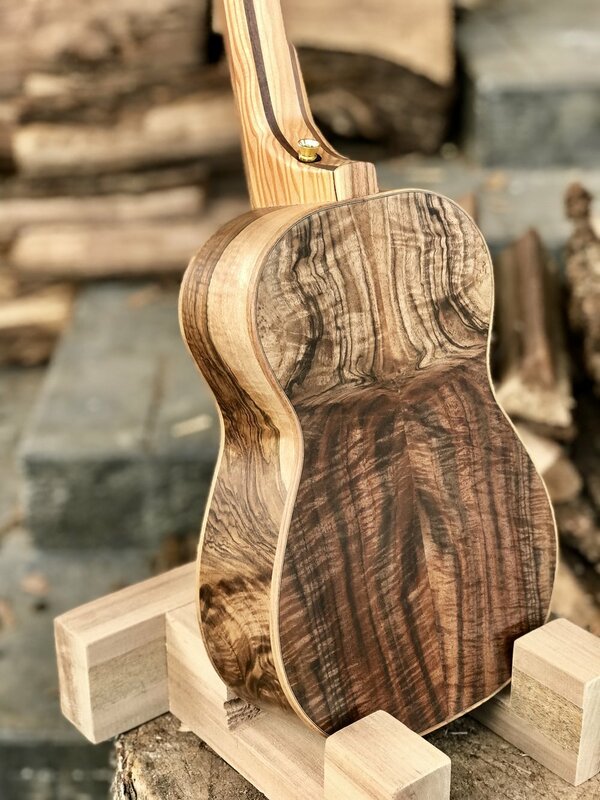 This asymmetrical super Curly koa includes a beautiful bit of sap wood on the edges to really make it look unique. I paired it with a salvaged mahogany neck and a relatively subdued pistachio fretboard. I decided to leave the binding off in order to let the koa shine without getting in the way. It has a dark and sweet sound, I’m happy it found a home with our friend Michelle. 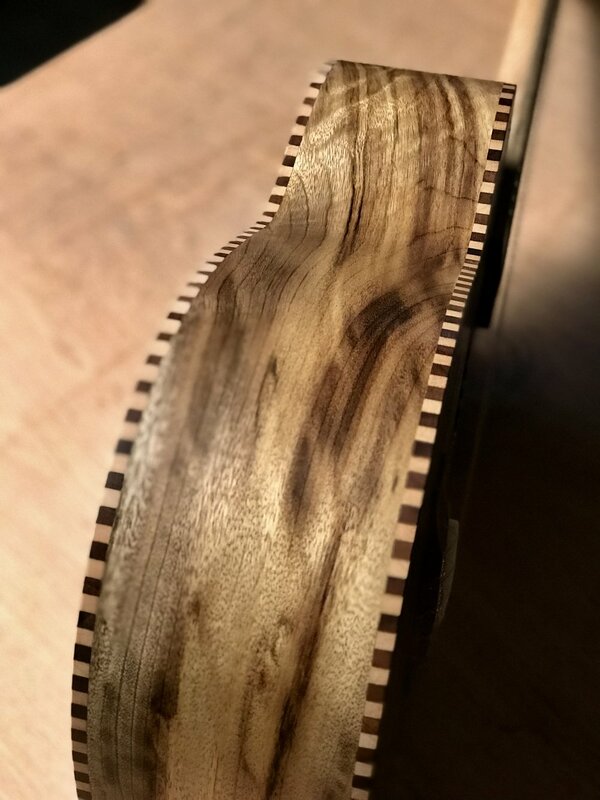 Come on people, look at that curly maple! What a treat it was to lay out the rim segments and the neck on this one. It’s hard to go wrong, just get out of the way and let the wood show you how to do it. 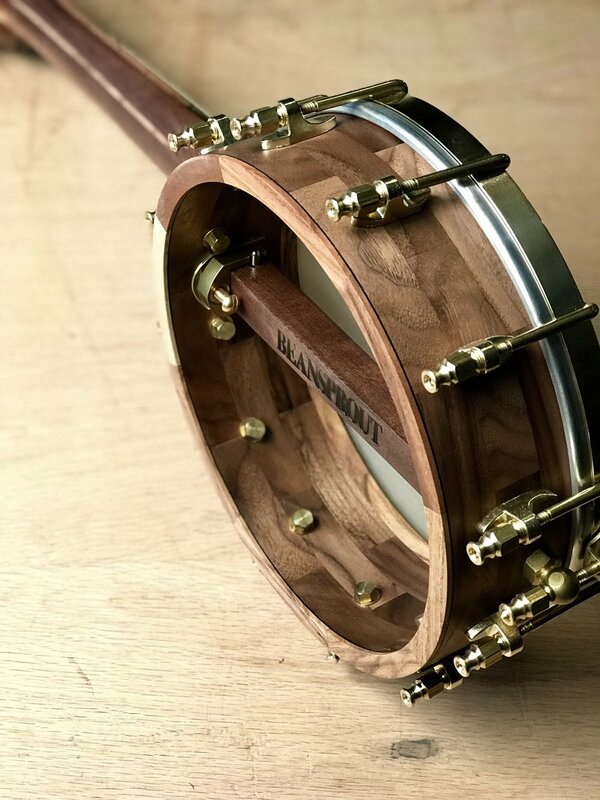 Maple gives a bright and clear tone and is a traditional favorite for banjo makers. This maple is from the Carpenter Ant Stash in Portland and the pistachio comes from California orchards. I don’t take the time to look at the materials as much as I ought too. It’s often the customer who comes back to me and points out the best natural features and notices the synchronicities in my improvisational wood layouts. I am just following my instincts to make good choices as I work to get the instruments out on time. In this case, I have to admit that this Bearclaw Spruce top from Alaska Specialty Woods slayed me. I actually stopped in the shop yesterday and just breathed and looked at it in the natural light. Flipped it over and checked out the grafted pistachio back from woodfromthewest.com. What is happening here? How do trees look like this? The fact that we get to use these special slices of our natural world to make music is even better. What an absolute blessing. 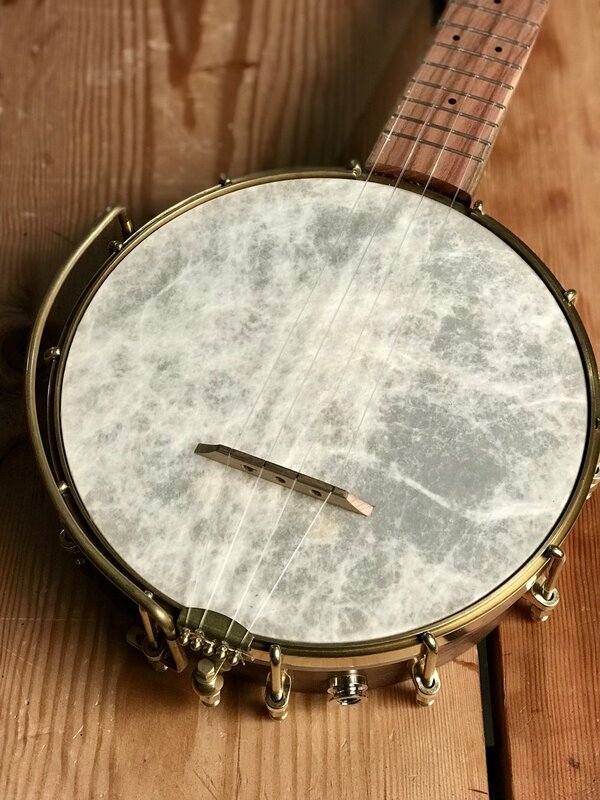 Although there is precedent for using oak in banjos, especially banjos from the 19th Century, there aren’t many modern banjos being made with it. After making a few, I’m really not sure why. It looks nice, has a balanced sound, isn’t too heavy, is easy to work and is readily available. I’m going to stick with it. This Oregon white oak comes from Zena Forest Products out of Salem. It is a family owned operation that sustainably manages their forest and provides high quality lumber. The two tone pistachio is culled from California Orchards. Notice how I also used grafted pistachio on the fretboard binding to off set the graft line in the fingerboard. Fun fun. This instrument is part of a set of three this month for a loyal customer. 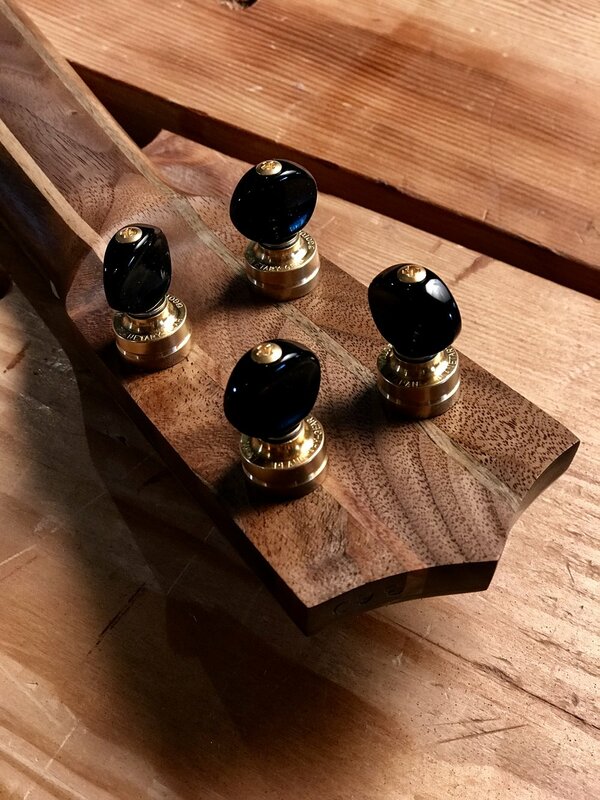 It was fun to set up a matched pair of tenor and baritone ukes and an additional Myrtle tenor for them. I like imagining these instruments as stand alone items as well as in conversation with their siblings. 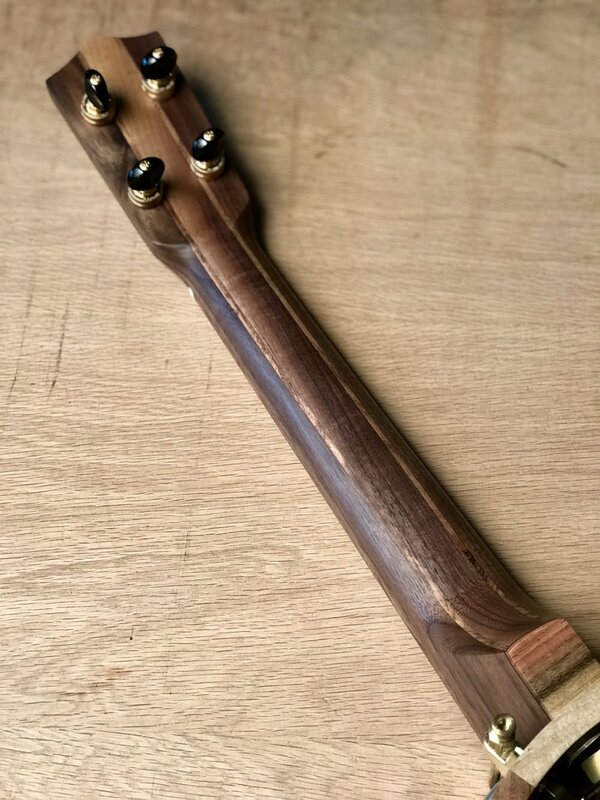 This particular instrument is a great example of my best looking and sounding woods, prepared to the highest level I am currently capable of. But, it is a piece of folk art before fine art, as it shows its hand made origins, is made with local materials on hand and celebrates tiny natural flaws and textures. 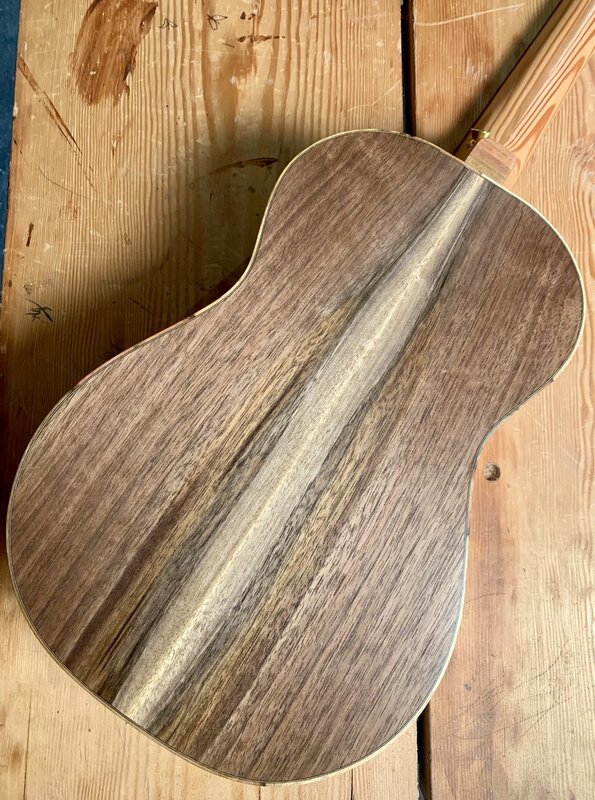 The Port Orford cedar top, grafted walnut back/sides and grafted pistachio comes from Oregon and California via woodfromthewest.com. The salvaged Douglas Fir for the neck comes from a barn in The Dalles, OR from Portland Salvage Works. The tone, volume, sustain and playability are spot on. It’s nice to look at but even better to play! The walnut I get from Goby in Portland comes from the cutoffs that are too small for the furniture makers to use. They harvest dead and dying trees from all over the Willamette Valley and plant five for everyone they cut. 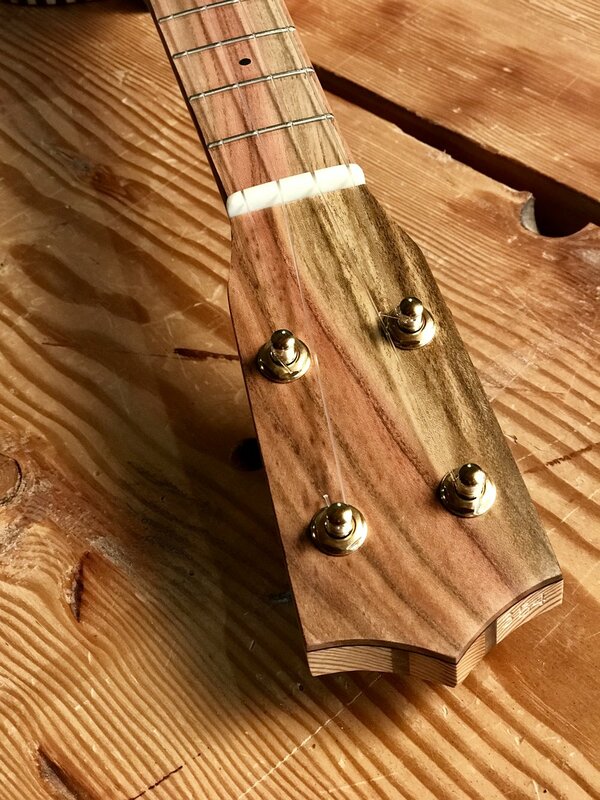 I also pay to have a tree planted for every uke sold, also trying to close the sustainability gap. The pistachio for this one comes from culled orchard trees from central California, harvested by woodfromthewest.com. 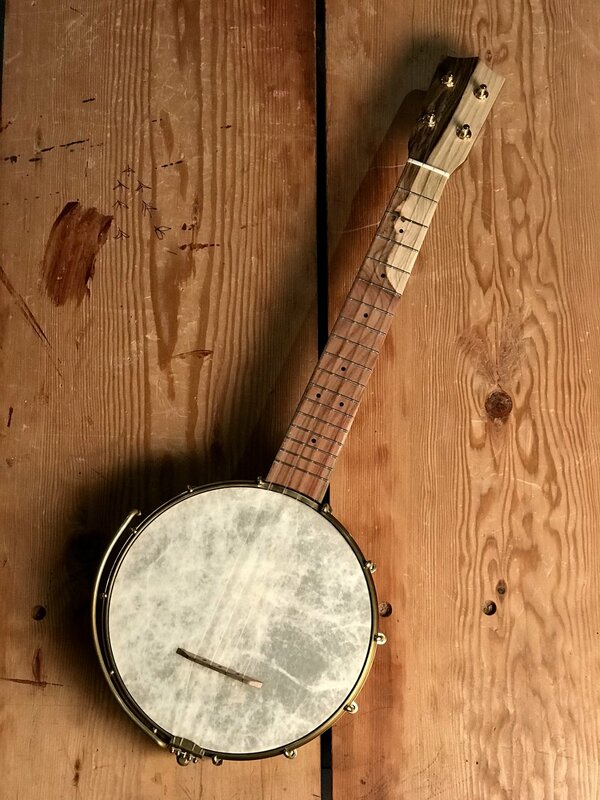 It may seem like these sourcing details are secondary to how the banjo looks, sounds and feels, but to me they are a primary factor. After all, these sourcing decisions help me to work closer to the original tree, support good suppliers and ensure that we are doing our best to be stewards of these beautiful North American resources. I love how each species of wood has its own character, but within a species there is also a great deal of diversity. Myrtle is a good example. It’s color can range from almost white to dark green/brown. I love this light colored curly stuff and I am really pleased with how it turned out. 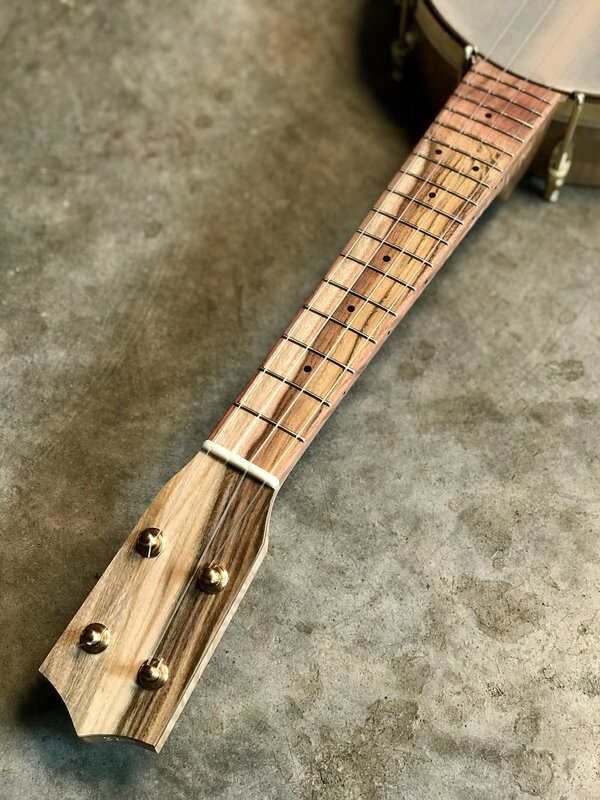 Wrapped in rope binding and paired with simple pistachio fretboard and a Fir floorboard neck. 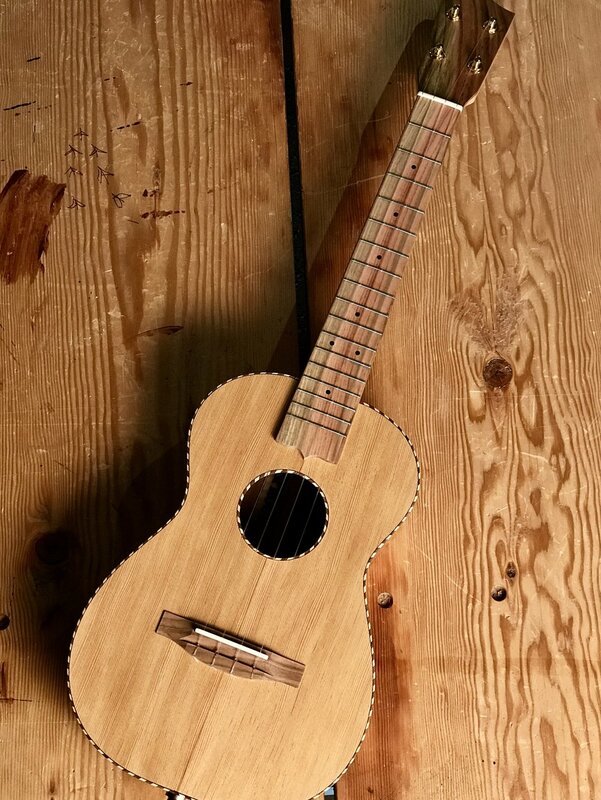 I received my myrtle tenor ukulele yesterday, and I absolutely love it. It sounds great, feels great, and is even more beautiful than in the photos. 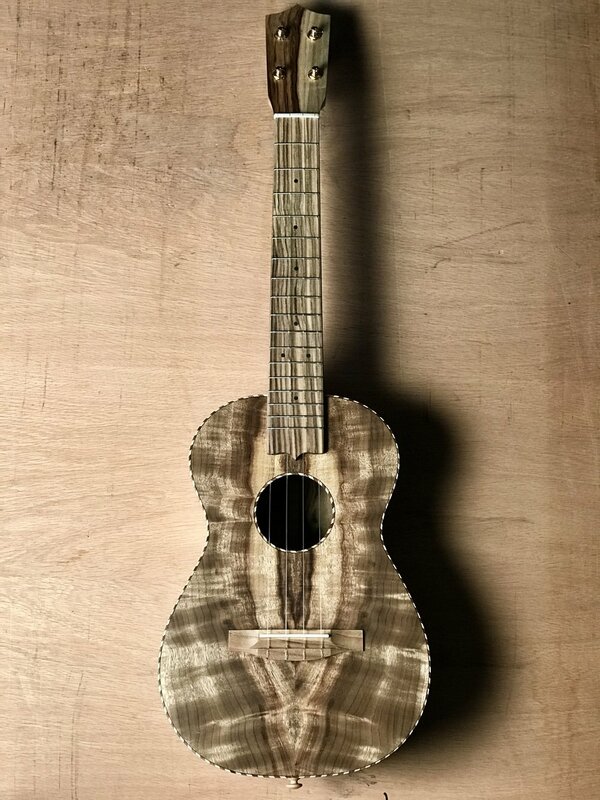 Magda asked for an alto ukulele similar to another I made that referenced Wabi-Sabi as an aesthetic and cultural influence. I happily set aside a set of this asymmetrical Myrtle for her, happy to continue to explore the idea. Wabi-Sabi is a Japanese idea that celebrates natural imperfection, muted earth tones, authentic textures and asymmetrical designs. It is an interesting exercise to explore this while making sure that tone and playability are un-affected. 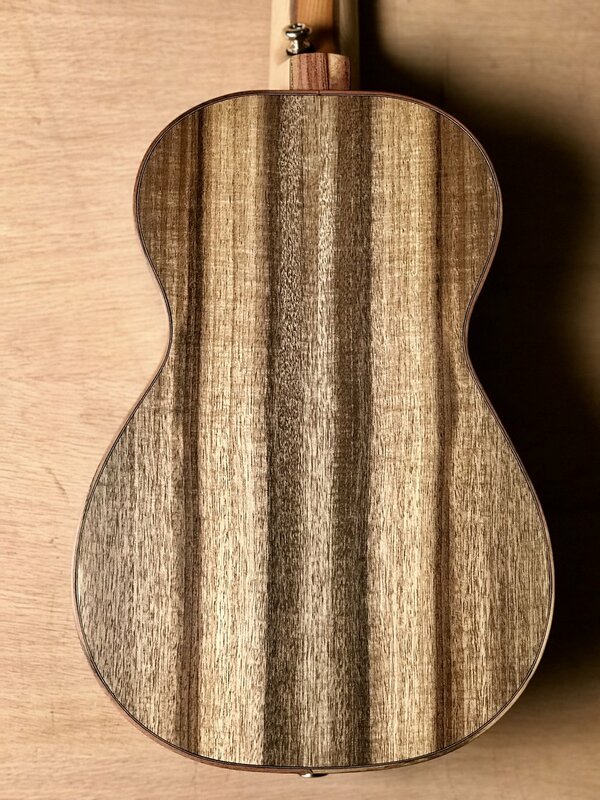 The Myrtle for this uke came from Char at Mya-Moe before she retired. The pistachio is from California Orchards and the Fir is from salvaged floor boards. Douglas Fir is an important wood for folks from the Pacific North West. It towers over our parks, builds our homes and is exported all over for Christmas trees. The modern, fast grown, plantation boards are wide grained and un-remarkable. The old growth has a suppressed grain, making it very strong for a soft wood and quite beautiful, in my opinion. I buy Fir salvaged from old buildings as often as I can. The Fir for this build comes from a barn in The Dalles, OR, purchased from Salvage Works in Portland. I just read on Wikipedia that Douglas Fir trees were also prized as material for Hawaiian canoes, as the logs washed up as drift wood. This bit of synchronicity gave me a chill, as I contemplate the meaning of my my career building ukuleles from this tree in Oregon. I am building from my prized local wood, just as the Hawaiians built from Koa. Yet, I prize the Koa I can manage to import from the islands, just as they prize these Fir logs. All of this is just a reminder of our local/global historical connections. 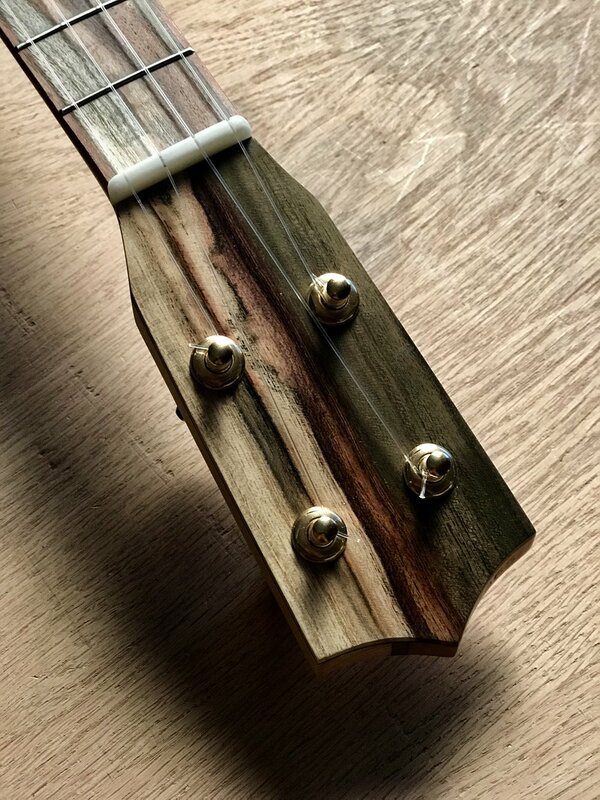 This tenor uke is finished off with beautiful pistachio from California orchards and maple/walnut rope binding. A classic design I hope to keep making for folks. When it comes to what I do, “custom” isn’t quite the correct description. I offer a few models and options and take customer input and requests, but I really make the majority of decisions. This one had a few requests that I was happy to honor and I’m glad I did. It made for a great instrument that is a little different than normal but still fits inside my values. 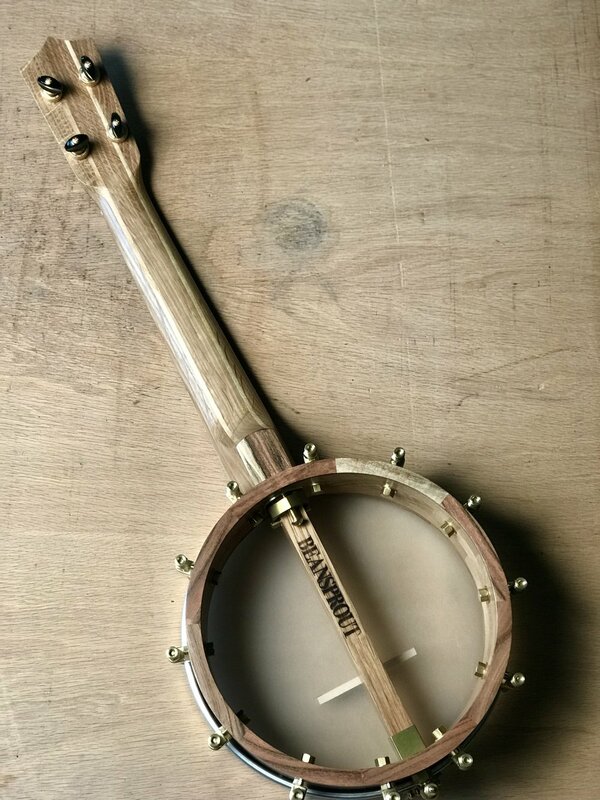 Specifically, the customer wanted a different brand of banjo head and a brass armrest. With the K&K pickup, it is certainly stage ready. 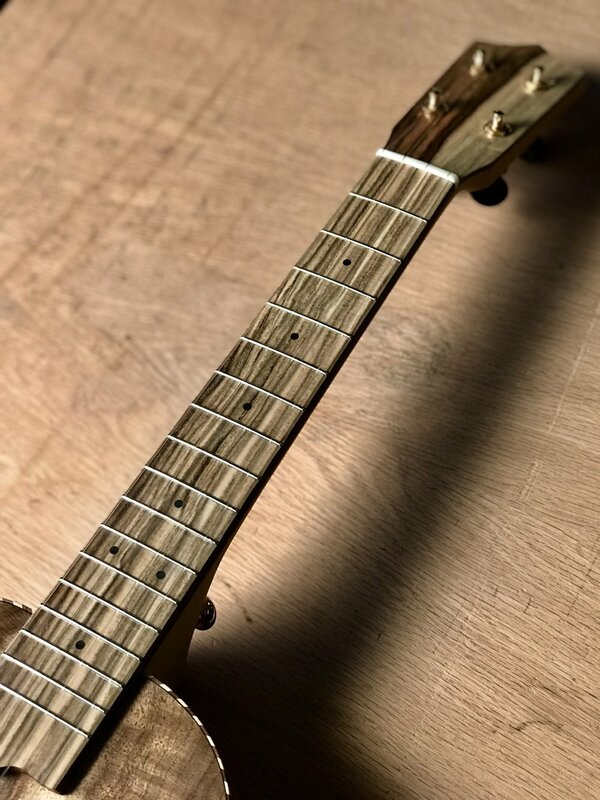 The pistachio fretboard and headplate are first class with the grain matchup and I love the big knot in the Oregon walnut neck. Pistachio is from California orchards, the walnut is from the Carpenter Ant stash in Portland. 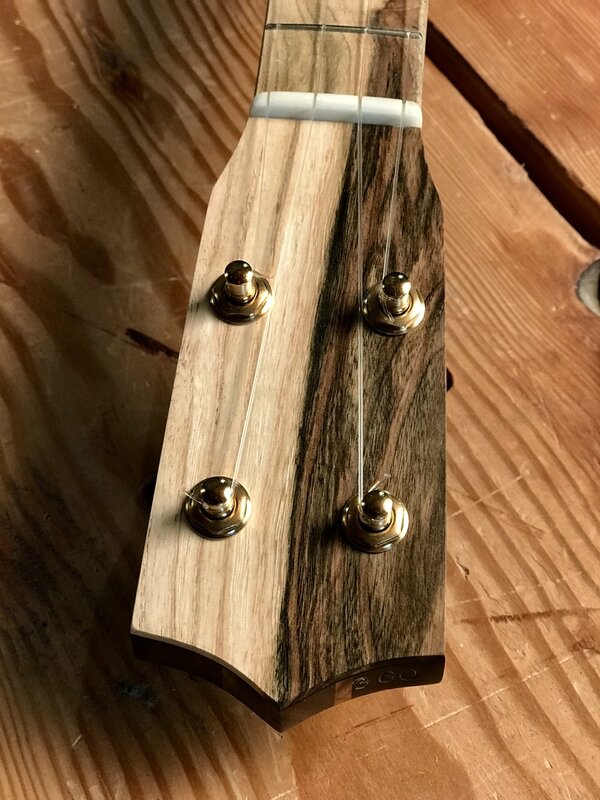 It has been fun this past couple of years to experiment with the interaction of a basic form (a banjo uke) and the variable aesthetic qualities of the materials (walnut, pistachio, brass). Each one is a unique item that is also related by form to it’s brothers and sisters. It feels like a long term art project with each instrument another entry in the catalogue. In this case, the Oregon walnut is from the Carpenter Ant stash and includes some curl and some sap wood. The California pistachio looks plain from far away but shows beautiful detail up close. It is just like the others but is an individual as well, #359 is ready for service. 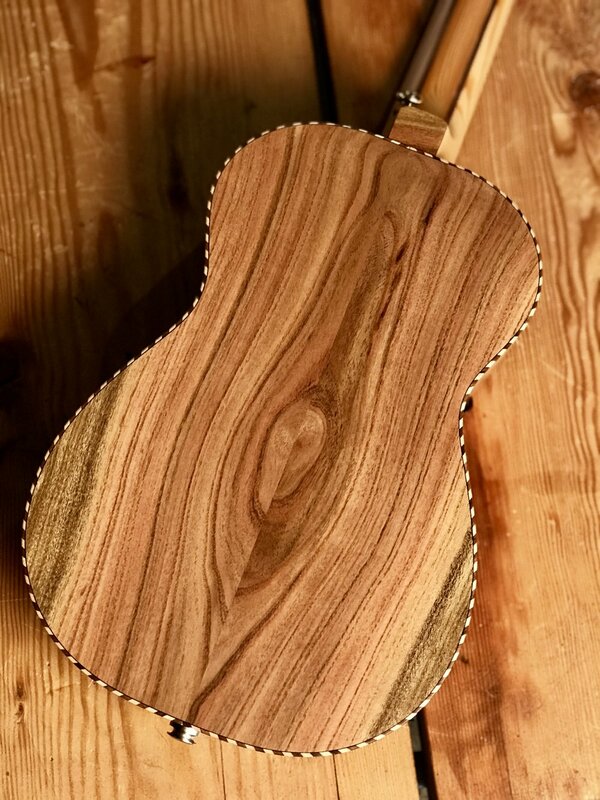 Another example of how Mastergrade Myrtle is “our” koa. It is beautiful, local and sounds great. The grain and curl on this one is one of a kind, so I wrapped it up in rope binding and paired it with straight grain pistachio and a simple spruce neck. Destined for our friend Tony, I’m sure it will be quickly put to service leading songs and jams. The Myrtle and pistachio comes from woodfromthewest.com. The spruce is from Camp Westwind on the Oregon coast. 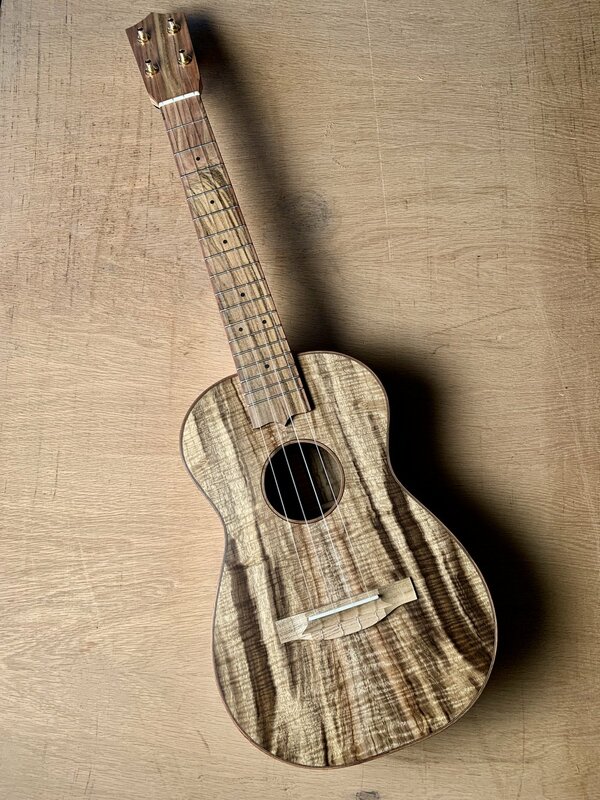 My Beansprout ukulele #352 arrived last Friday in great shape. It is breathtakingly beautiful. The Myrtle, the Pistachio, the workmanship, the sound are as good as I ever hoped for. 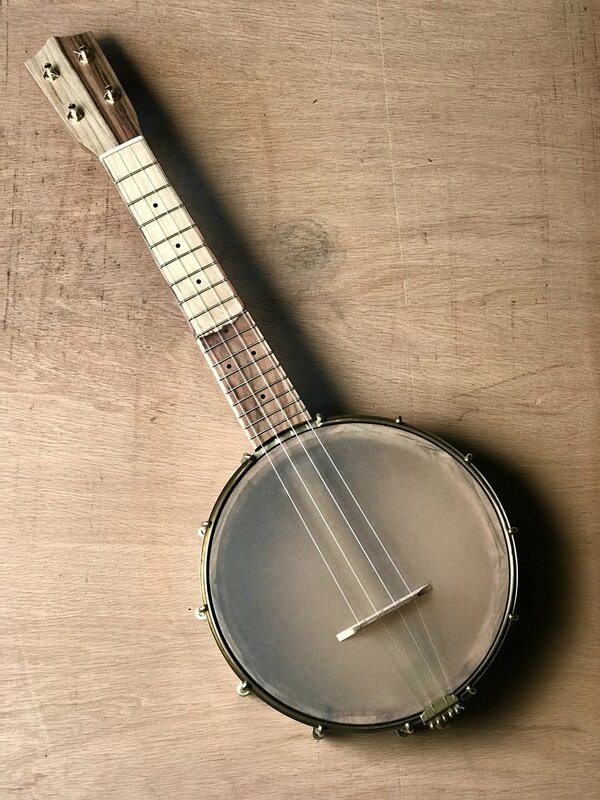 The Myrtle is so beautiful, that while I generally don’t name my music instruments, #352 is now officially “Myrtle.” Kind of a neat old-fashion name that means time honored beauty to me. I have played Myrtle at home, on breaks at work, and in a couple of Twin Cities Ukulele Club jams. Wonderful! While everything is great, a real highlight for me is the neck shape, width and depth. Sooooooo comfortable! Thank you for Myrtle! This photo is from a weekly Wednesday morning jam with a bunch of bluegrass guys - guitars, mandolins, fiddles, banjos and Ubass. Myrtle truly more than held her own! 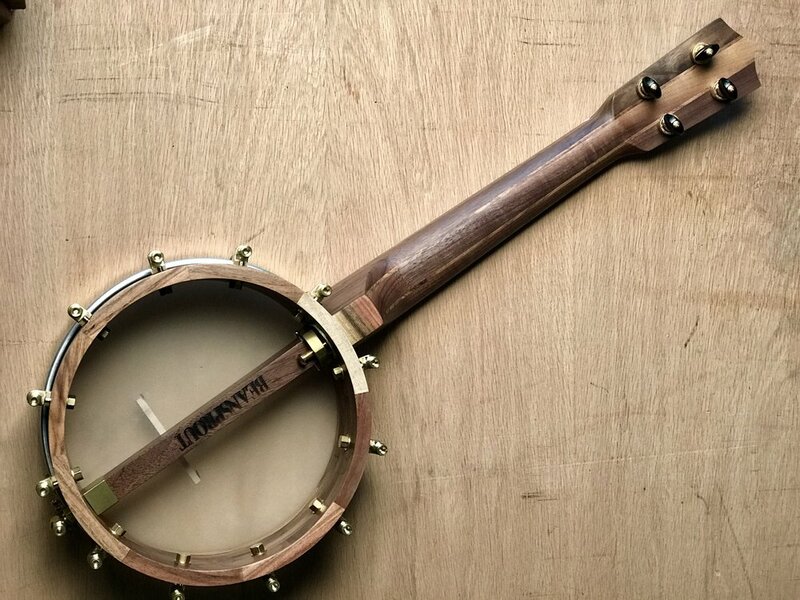 The last instrument I made for Nicole was for our 10th wedding anniversary. 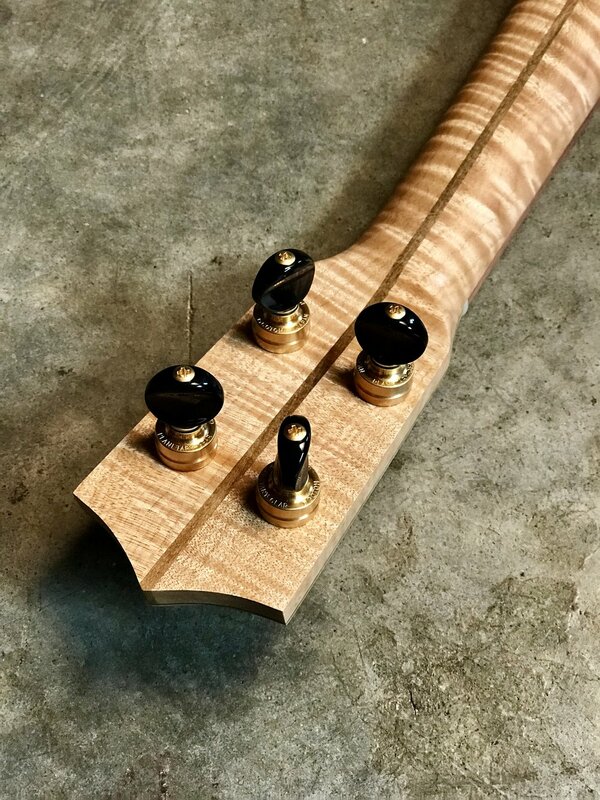 It was a Mya-Moe Myrtle tenor cutaway with custom inlay. It has been all over the world since then and Nicole’s main uke. She recently asked for her own Beansprout and picked out two sets of Myrtle. 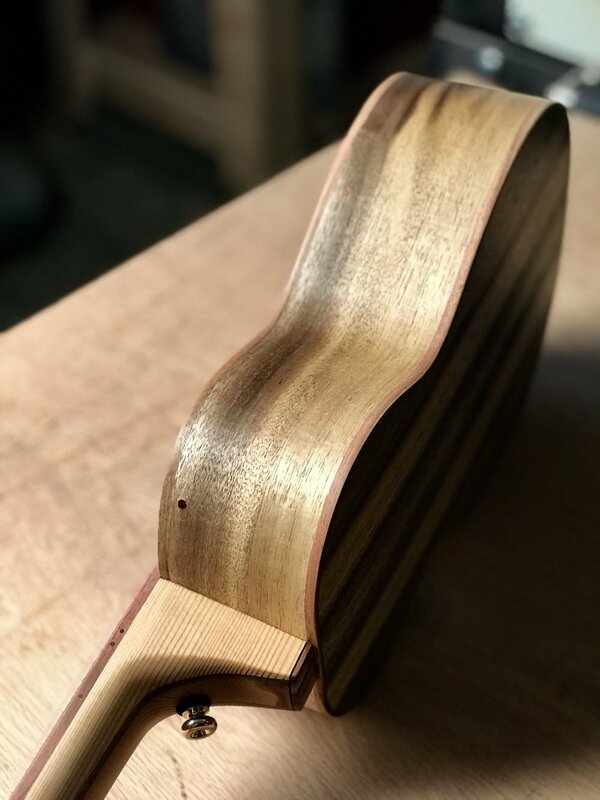 I started on her uke but made a mistake and had to scrap the top. She asked to start over with the other, plainer set and it was a good thing. This uke, like Nicole, feels strong, wise, calm and focused. Her last uke was whimsical and fun, but this better suits her and our current business/marital relationship. She is the foundation on which all of my work rests and she deserves all the love and praise in the world. This one is for her. The striped Myrtle and pistachio comes from woodfromthewest.com. 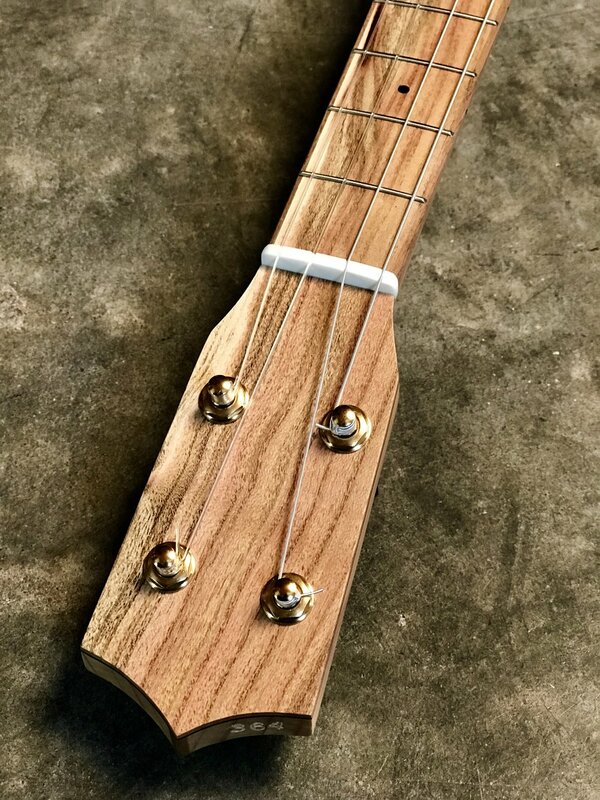 The neck is made from salvaged fir floor boards.